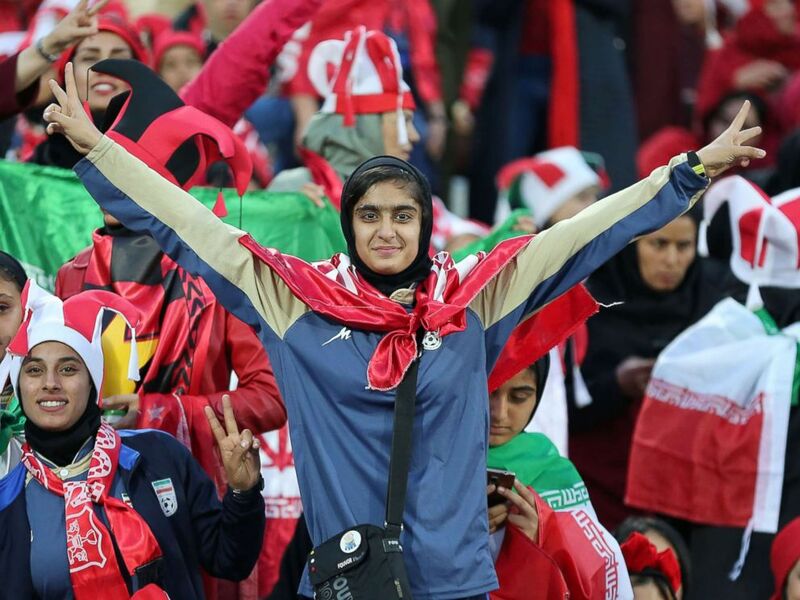 After a nearly forty-year ban, hundreds of Iranian women were allowed to attend an international soccer final at a stadium in Tehran on Saturday, where they managed to secure nearly one percent of the seats at Azadi Stadium. 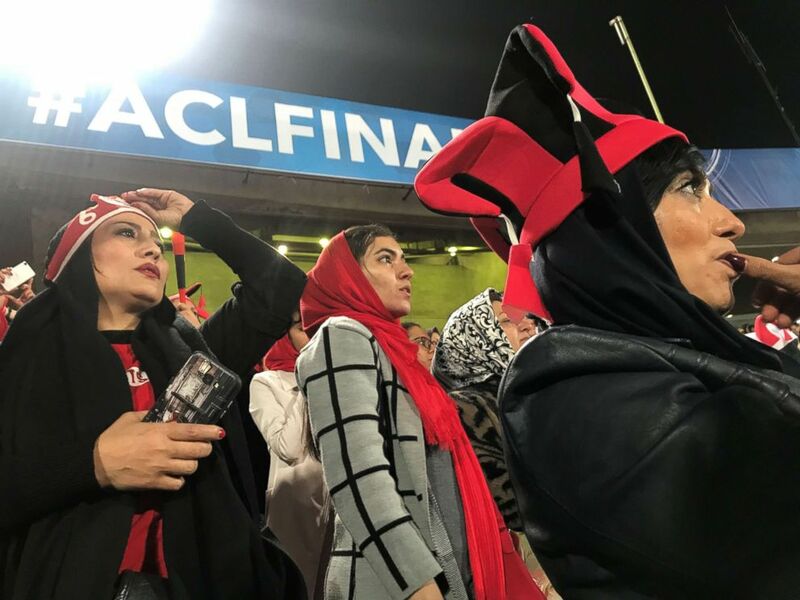 Saturday's event -- the Asian Champions League final pitting an Iranian team known as Persepolis against a Japanese squad called the Kashima Antlers --- saw the most significant female presence at a top soccer match in Iran since the Islamic revolution in the late 1970s. 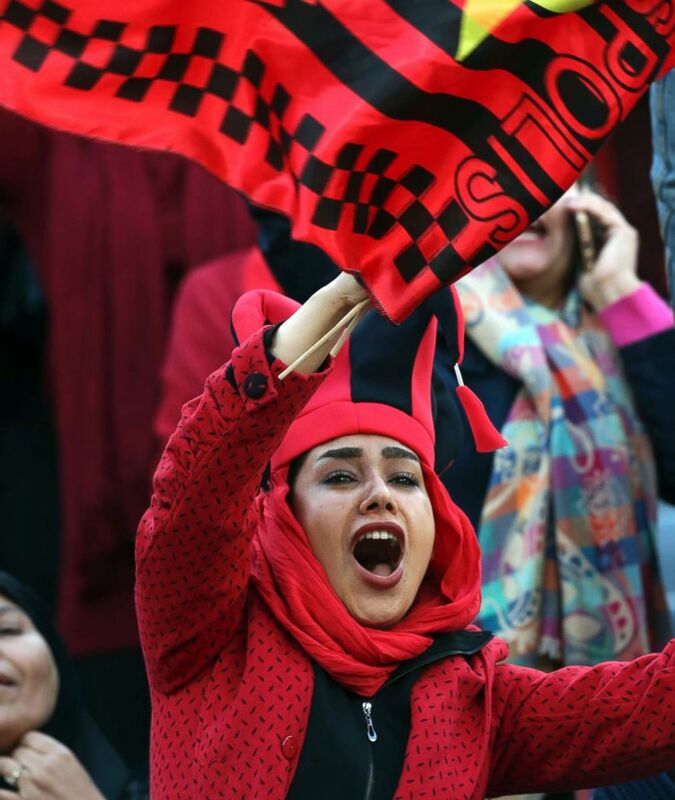 Iranian conservatives have persistently been opposed to women attending live sports matches, but cultural pressure has been steadily building against the ban. “It is time to let women in,” said Reza, 45, a real state employee who was trying to find a ticket to enter the stadium. "We are fed up with so much economic pressures. We all need fresh air," he said. Reformists and women’s rights activists have been pushing for opening the doors to stadiums for years. Besides, pressures from international bodies seeking Iran's compliance with their required equality standards have occasionally forced Iranian authorities to let at least a small group of women in. Female fans of the Iranian soccer team Persepolis react as the team misses the chance to score a goal in Tehran's Azadi Stadium, Nov. 10, 2018 in Iran. The practice invited widespread criticism by social media users who alleged that there were select groups of women attending the stadium to fulfill international expectations, an allegation denied by authorities. “I prefer watching nonsense soap operas than Persepolis and Kashima’s match with this way of selecting the spectators,” wrote Samira Alampanah on her Twitter. It is time to let women in...We all need fresh air. Waiting outside the doors about three hours before the match, Yalda, 28, said “we want to get in for Persepolis." 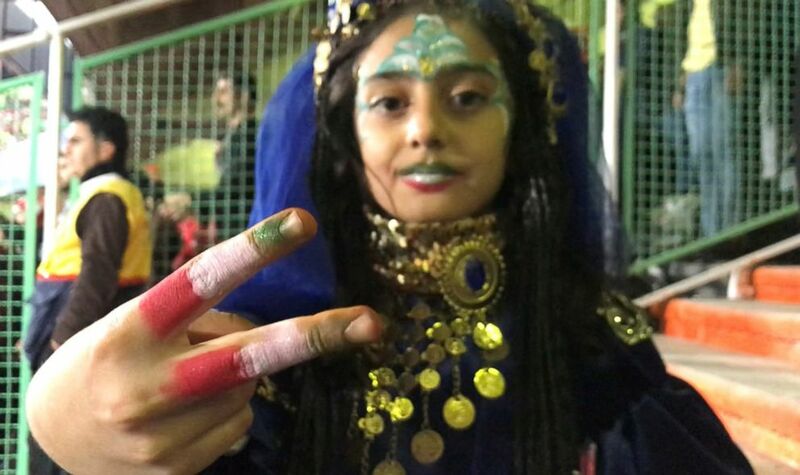 A female fan of the Iranian soccer team Persepolis makes a gesture while posing for a photograph in Tehran’s Azadi Stadium, Nov. 10, 2018 in Iran. "So, it will have some real fans on the seats, not just the select group allowed in to appease FIFA and AFC,” she said, referring respectively to the international and Asian governing bodies of professional soccer, the Fédération Internationale de Football Association and the Asian Football Confederation. Outside the U.S, soccer is known as football. But Yalda’s path was tougher than she had imagined. She and a group of about 200 fans had to pass three gates before entering the stadium -- each one of which kept their hopes of getting in hanging in the balance. Ironically, some of the women reported, the officials at each gate were as uncertain as women themselves. “I’ve been told ten times to go home and watch the match on TV, and then another official comes and says 'there is still hope,'” said Mahsa Taheri, 27, an accountant who decided to skip a day at work once she heard that women would be allowed in. 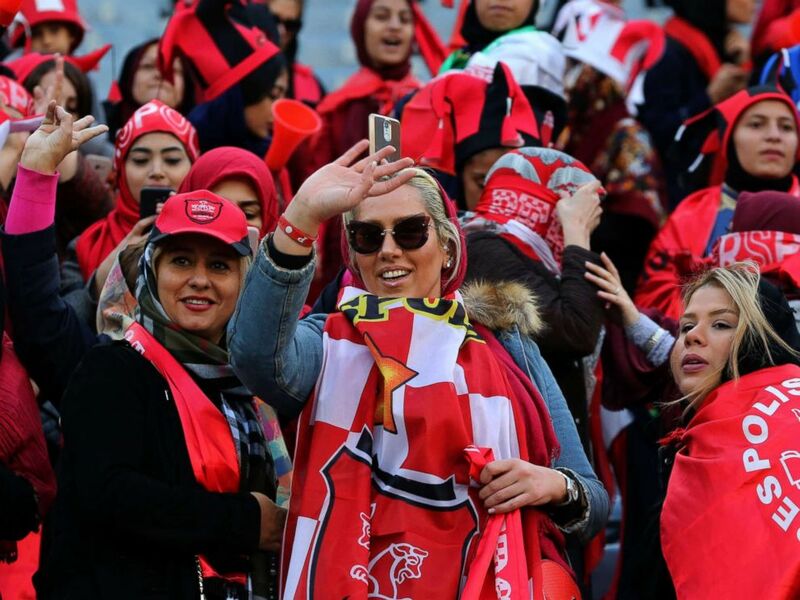 Persepolis' female fans cheer for their team on Nov. 10, 2018, at the Azadi Stadium in Tehran. After several hours of waiting, the gates were eventually opened for Yalda and others. A security official who requested anonymity told ABC News that Fariba Mohammadian, Iran's Women's Deputy Minister of Sports, helped exhausted and intimidated female fans into the stadium. I prefer watching nonsense soap opera than Persepolis and Kashima’s match with this way of selecting the spectators. But, by the time the women got inside, the section of about 850 seats allocated to females was almost full. Despite being on their feet at the gates for hours, the newly-arrived fans started to cheer their team, many shedding tears of joy. Female Iranian fans support their team on Nov. 10, 2018, at the Azadi Stadium in Tehran. Infantino thanked Iranian President Hassan Rouhani for paving the way for the women's attendance at the stadium. A female Iranian spectator cheers as she waves a flag of Persepolis prior to the start their soccer match with Japan's Kashima Antlers at the Azadi stadium in Tehran, Iran, Nov. 10, 2018. Once allowed in, some fans burst into tears of joy which were subsequently supplanted by tears of disappointed fans. Persepolis lost the final to its Japanese rival. “One thing I am sure is that we will definitely come again,” Maral said.